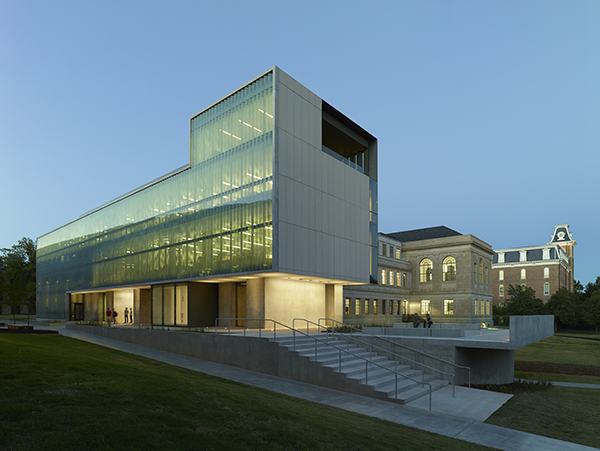 The Fay Jones School of Architecture at the University of Arkansas is a striking and effective hybrid of a beautifully restored historical building, Vol Walker Hall (65,000 SF) and a contemporary insertion and addition, the Steven L. Andersen Design Center (37,000 SF). 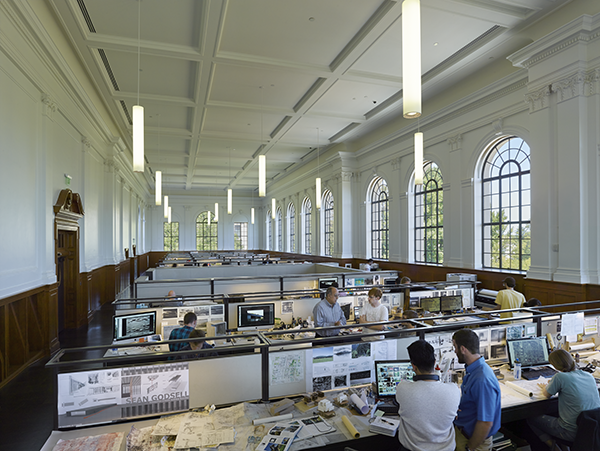 The ensemble invigorates the historical center of the campus and instills new life in Vol Walker Hall, the campus’s original library and home to the School of Architecture since 1968. The overall design has achieved LEED Gold in recognition of the sustainable and urban strategies employed. 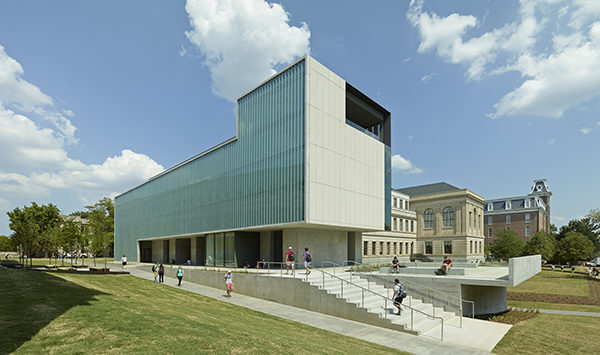 The Anderson Design Center is a modern complement to the traditional architecture of Vol Walker Hall, sensitive to the past and conceived to enhance the spatial character of the historic campus plan. The footprint of the addition mirrors that of the traditional structure’s primary east wing, physically and conceptually balancing the old and the new. The building’s modernism resonates with its neighbors through similar materials and proportions. Regulating lines established by the classical composition and proportions of string courses, cornice lines, fenestration and moldings of Vol Walker Hall generated the organizational system for the elevations of the Anderson Design Center. 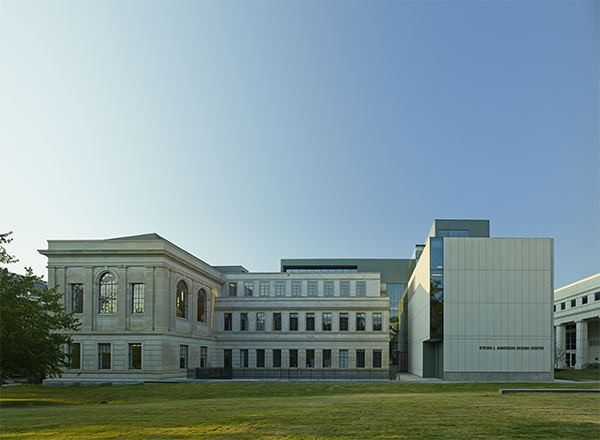 Post-tensioned, architectural concrete construction and Indiana limestone rainscreen give the addition weight and substance that honor its historic Beaux Arts counterpart. 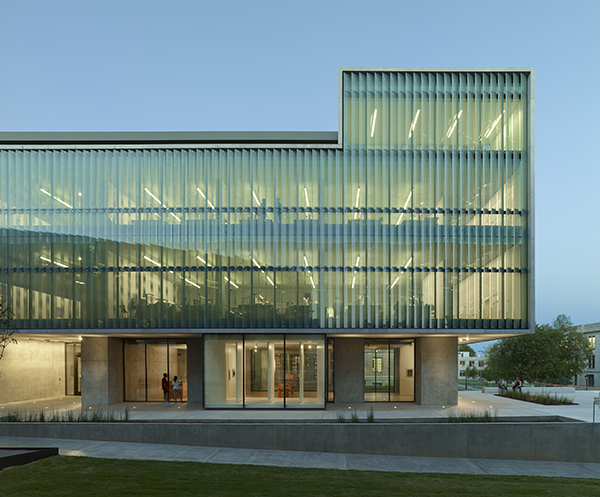 A fritted glass brise-soleil screens the intense western sunlight from penetrating the curtain wall that allows natural light to fill the studios, and is additionally used as a teaching tool to illustrate construction methods, detailing, and environmental strategies. 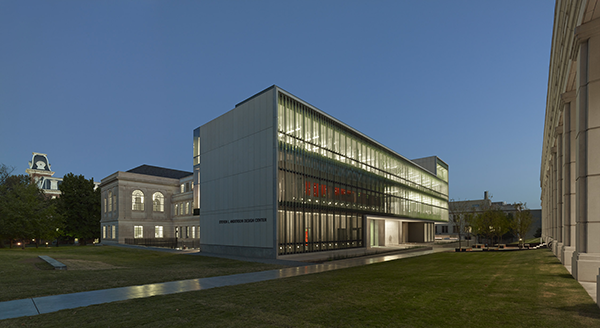 The brise-soleil lifts up to expose and frame the western entrance and the design gallery, which displays the work of the design disciplines to the campus community. The contemporary articulation of the addition’s western portal, graciously set back under a generous overhang, with its tripartite glass doorway emulates with precision the proportions of the historic porticoed east entrance, visible in the distance upon entry. Obsolete stack spaces at the center of the building were removed to make room for the addition and to restore this circulation route on the primary axis of the University campus. 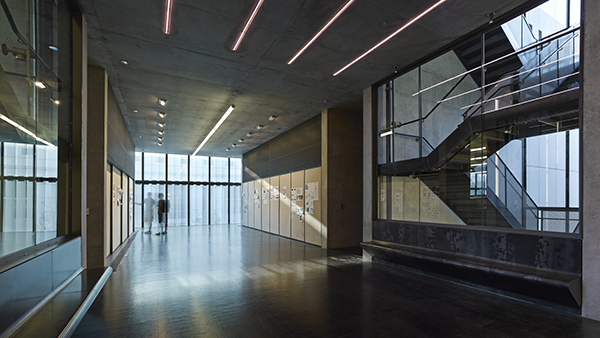 A visual sliver of glass in the north and south elevations, twin glass enclosed stairwells reveal the gap between restoration and addition, connecting old and new and delivering daylight and activity into the center of the building. 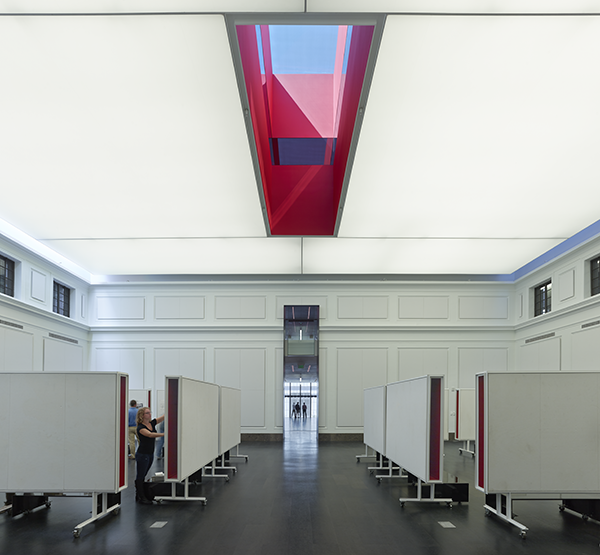 Careful detailing of an oculus passing between classrooms above and a backlit fabric ceiling transforms the previously dysfunctional central gallery into a vibrant gathering space at the heart of school. 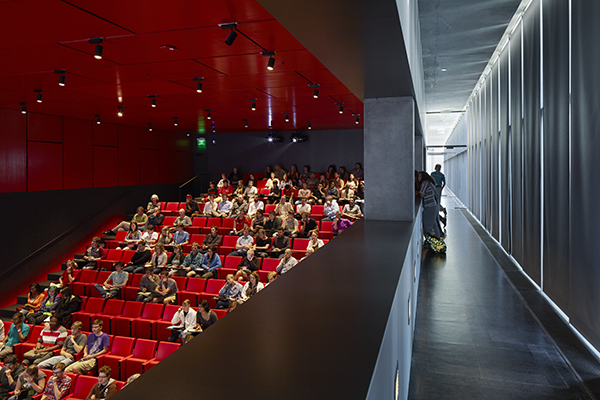 Studio and critique spaces are provided throughout the addition, as well as a new 200 seat auditorium that descends to the ground level. 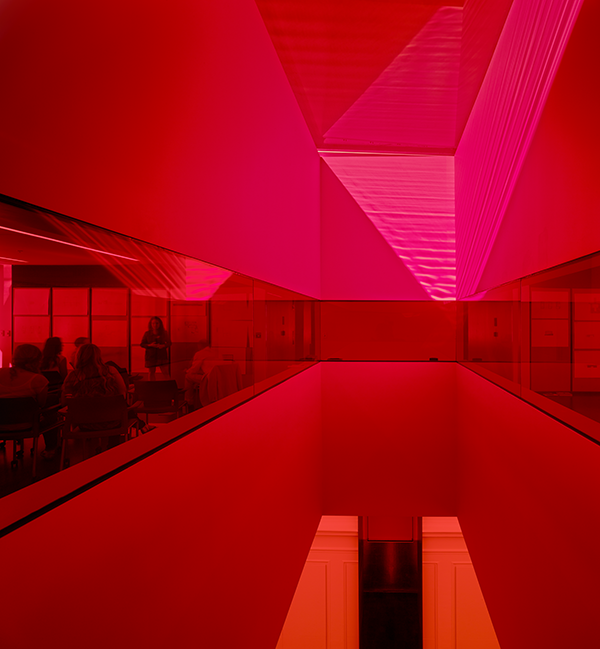 Below the rake of the seating, the student lounge and organization hall feature custom felt seating and ambient lighting. 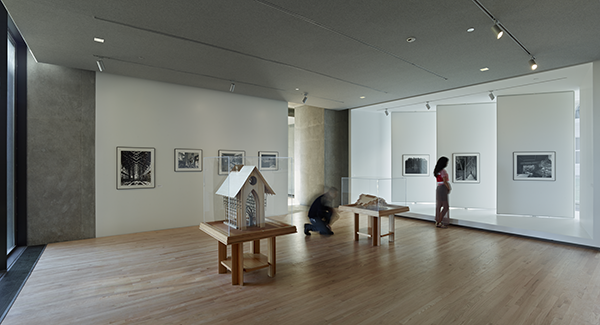 The Andersen Center’s expansive roof terrace is both a green roof and a covered outdoor classroom; the elevated vantage point affords dramatic views over the surrounding campus, city, and landscape.